It was an absolutely unforgettable, GLORIOUS day, for so many reasons. One being that it was unexpectedly, deliriously beautiful outside. Not a speck of wind, and with a warm, sweet spring sun. It FELT like a warm summer day. It was Valentine’s Day Sunday and we were heading south to make a ‘Valentine’s Human Heart for Madalene’. We all braved a traffic jam of epic proportions. Creeping down Highway One at a snails pace, I was squirming with excitement. I had a carload of red balloons and 100 feet of black nylon rope I intended to use as the “form” for the heart we were going to create using our bodies on the beach a few miles south of Pacifica. 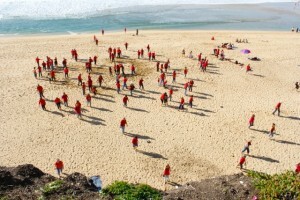 Friends and family of Madalene and myself, as well as a hundred wonderful volunteers from my weekly Monday Hearts for Madalene list donned red shirts and made the pilgrimage down the craggy dirt path along the Pacific Highway to the pristine golden beach below. We all were excited to “see” what would emerge in the camera viewfinder, after shaping and fine-tuning our standing bodies, one inch this way, two steps that way…. 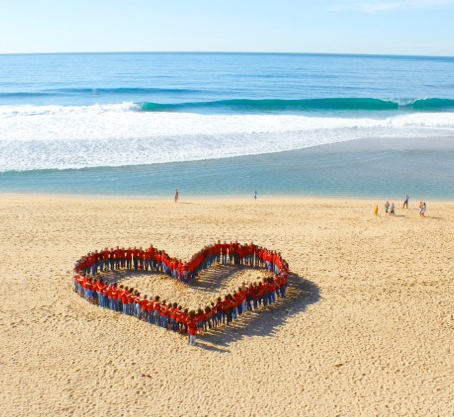 120 women, men and children of all shapes and sizes gathered and fell into formation standing along the outline of the heart. My dear friend Kath up on the bluff hundreds of feet above the beach and I volleyed photos and instructions via text message as the heart began to emerge. I climbed the hillside and parked myself at the edge of a profoundly frightening shear cliff several hundred feet high and looked through the camera lens. I began to scream with excitement. We were almost there! With my friend Maggie’s saintly patience, our collective determination and vision, and using only iPhone communication, we slowly fine-tuned the group one-by-one into the shape of our beautiful heart. I shot several hundred photos trying different poses—arms out—arms up—hands to the side, etc. Facing in and facing out. When I was almost ready to start shooting, I decided to try one last position. I asked the group to interlock arms over their neighbors to the left and right. I can’t explain adequately with words what I saw. But I yelled and whistled and screamed to the crowd below. WOW!!! WE GOT IT!!! The whole image absolutely VIBRATED off the camera screen. IT WAS SUPERB! It was like the collective ENERGY of the group was finally all connected as one—arm in arm—the energy flew around the heart and it began to glow as if from the heavens. Absolutely stunning. I was speechless. We did it. MAGIC!!! Read more about me on Epochalips HERE.